← Will latest NC Common Core Math Revisions be just a New Shade of Lipstick on a Pig? Probably. This article first appeared at American Lens News on April 14, 2017. The number of registered voters in 15 counties in North Carolina surpasses the number of voting age citizens living in them according to a report from Judicial Watch. According to that same report, 10 other states join North Carolina in having more registered voters than voting-age citizens living in various districts. The group announced Tuesday it has sent notice-of-violation letters to 11 states that combined have more than 100 counties where the number of registered voters surpasses the number of citizens of voting age. States that received the letters were Alabama, Florida, Georgia, Illinois, Iowa, Kentucky, Maryland, New Jersey, New York, North Carolina, and Tennessee. The districts listed by Judicial Watch in North Carolina that had more registered voters than actual residents are Buncombe, Camden, Chatham, Cherokee, Clay, Dare, Durham, Guilford, Madison, Mecklenburg, New Hanover, Orange, Union, Watauga, and Yancey. Not on the Judicial watch list is Wake County, which according to The Public Interest Legal Foundation, who has filed suit on behalf of the Voter Integrity Project. Washington Free Beacon reports that an organization called Demos is fighting election integrity suits in multiple states, including the one in North Carolina. Demos, which is heavily funded by George Soros, is chaired by Senator Elizabeth Warren’s daughter. The Southern Coalition for Social Justice is one of the many partners of Blueprint NC, known for the famously leaked memo calling for left-wing groups to ‘cripple and eviscerate’ all Republican officials in the state, in particular, former Governor Pat McCrory. Multiple counties in the state also saw lawsuits and complaints filed over voting irregularities and registration discrepancies. In fact, 50 such complaints were filed statewide. One such lawsuit involved the Civitas Institute, which contended that counting same-day registrants ballots in the certified results before the voter registrations can be verified violates state law. 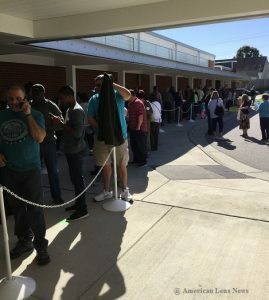 New Hanover County saw two elections protests filed during the 2016 election cycle, as did Durham county, where alleged issues in ballot processing took place during the entire 17-day early voting period and well into Election Day in over five precincts. A complaint was filed in Durham that included an accusation of official misconduct. The number of questionable ballots in the Durham case was estimated at approximately 90,000 — which would have impacted every major race in the state. Bladen County also saw it’s share of voter registration shenanigans where numerous ballots were in question of being altered by multiple persons engaged in a “Get Out The Vote” operation funded by the Bladen County Improvement PAC. The North Carolina State Board of Elections announced that the registered voters and ballots in question in Bladen county would stand, despite evidence the ballots were tampered with. American Lens dug deeper in Bladen County and found another complaint similar to that of the one filed in 2016. The other complaint had been filed during the 2012 election cycle. The 2012 complaint listed names of individuals accused of tampering with voter registrations that were also listed in the 2016 complaint. 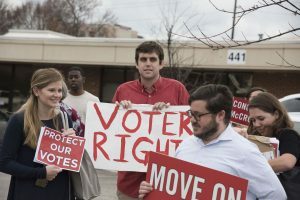 American Lens reported earlier this year on voter registration anomalies with regard to college students on multiple campuses in North Carolina. American Lens visited the site and found it was a gravel parking lot. According to North Carolina General Statute, the definition of “residence” contains a provision that one’s voter residency at the time of registration should be where one sleeps. Note: Voter Residency Statutes were recodified in 2017, however, still do not allow for mass registrations to a parking lot or similar space. This entry was posted in Am Lens, ELECTIONS, POLITICS NC and tagged Carolina Chaos, Election 2016, Voting Complaints. Bookmark the permalink.